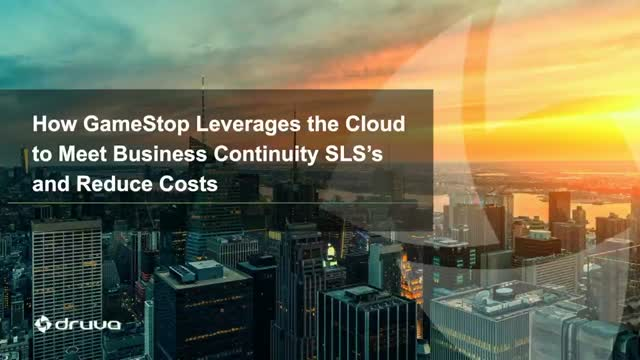 GameStop, a global Fortune 500 company (NYSE: GME), needed an efficient cloud backup and recovery solution to meet business continuity requirements across its 7,200 retail stores in 14 different countries. The company had a myriad of virtualized environments with over 250TB of data but its on-premises backup infrastructure and procedures were so complex and inefficient, that GameStop was unable to meet business continuity SLAs. Don't miss this informative webinar — Register today! Join us for the first in our new customer spotlight series — a forum where IT and business professionals can hear best practices from peers and exchange ideas and insights on data protection and management best practices. More than half of all enterprises report that they've experienced a ransomware attack in the past 12 months - with the majority experiencing multiple attacks. So what's the impact? Lost productivity, loss or exposure of sensitive data, loss of current revenue and even the risk to future profitability. How do you quantify the risk? And more importantly, how do you address it? Do you think Office 365 is enough to protect your business data? Would you bet your career on it? Hear from industry expert, Michael Osterman of Osterman Research on how to step up your data protection game. Imagine that you're responsible for a massive construction project and you just lost your data due to a disaster. Blueprints? Gone. Timelines? Gone. Drinks? Might be time for one! Losing your data is a reality that every company faces—construction is no exception. That's why Egan Company—a leading specialty trades contractor in Minnesota, unsatisfied with their previous backup products)—turned to Druva Phoenix to ensure their critical data was backed up and fully accessible in the event of a disaster. It's no secret that managing the backup and restore of your virtual machines on-premises and in the cloud is unnecessarily complex. Managing multiple vendors and disparate solutions not only increases your costs and degrades visibility, but it also puts your organisation's critical data at risk. Luckily, there's a better way with an all-in-one, cloud-native solution. As organizations continue to migrate to Office 365 for their email, productivity and collaboration tools, they’re quickly realizing that Office 365’s native capabilities do not provide the essential data protection capabilities they need. Parker Sinclair Sales Engineer, Druva Inc.
Did you know that you can simplify data protection for enterprise workloads with a single cloud solution for backup, archival, and disaster recovery? Attend a 30-minute live demo of Druva Phoenix and our product expert will answer all of your questions! According to Cisco ransomware is growing at a yearly rate of 350% and is estimated to have cost organizations $5 billion in 2017. As attacks become more sophisticated and prevalent, IT organizations need to ensure they have a strategy to mitigate the risks of ransomware and other malware attacks. Join us and discover how 82% of organisations recovered from a ransomware attack by restoring data from cloud backup. According to Cisco, ransomware is growing at a yearly rate of 350% and is estimated to have cost organizations $5 billion in 2017. As attacks become more sophisticated and prevalent, IT organizations need to ensure they have a strategy to mitigate the risks of ransomware and other malware attacks. Druva Cloud Platform provides organisations with a single control panel to protect and manage all of their IaaS, PaaS and SaaS environments as well as their server and endpoint data. As an AWS Tier 1 Technology Partner, Druva's unique AWS cloud-native architecture and Data Management-as-a-Service solution means that organisations can leverage a pay-as-you-go service without the need to invest in additional hardware or software. Druva aggregates business critical data for scalable backup, archival and disaster recovery, while also unlocking the true value of search and advanced analytics for governance of that data. Join presenters from Druva and AWS to learn about Druva’s all-in-storage-SaaS on AWS and the value this partnership can bring to your organisation. Don't miss this informative webinar - register today! Don't miss this informative webinar register today! Managing the backup and restore of virtual machines is an intricate process involving multiple staff and a complex infrastructure. This dependency on these cumbersome, error-prone, multi-tiered systems results in high costs for backup and archival storage, putting your data at a higher risk. Organizations today are now looking to the cloud as a viable, cost-effective alternative to protect against the pitfalls and inefficiencies of traditional VMware backup and disaster recovery (DR). Seyi Verma is a Director of Product Marketing at Druva. He has over 16 years of experience in product management and marketing, driving initiatives around product launches and strategy for both hardware and software. At Druva, he leads product marketing for Phoenix, the company’s data protection and management solution for physical and virtual infrastructure. With data growing faster than ever before, managing data center infrastructure can be costly and complex. In addition to adding resources, hardware and tapes, you need to ensure visibility and control over remote and global sites to avoid data silos, and risks and compliance issues. That’s why the cloud became such a game changer for modern IT environments. We will conclude with a product Demo, when you can get an in-depth look at product admin consoles and client UIs. Momentum of cloud adoption for virtual workloads continues to grow, but it’s not without challenges. While there are a variety of motivations driving this transition, one thing is clear: organizations are still figuring out what the best approaches are. No matter where you are on your journey to the cloud, understanding the role the cloud plays with your virtual environment has become an integral part of your IT initiatives. Join this live panel discussion with experts at VMworld Europe to learn what the future holds for data centers and hybrid cloud management. This live panel will be streamed directly from VMworld Europe in Barcelona! Join us for live Q&A from the comfort of your desk. Migrating to a new OS, like Windows 10, or performing upgrades can be time-consuming and complicated. Discover how to streamline OS migration, and maintain business productivity, by leveraging endpoint data protection with Druva inSync. Druva is the leader in converged data protection, bringing data-center class availability and governance to the mobile workforce. With a single dashboard for backup, availability and governance, Druva’s award-winning solutions minimize network impact and are transparent to users. As the industry's fastest growing data protection provider, Druva is trusted by over 3,000 global organizations on over 3 million devices. Learn more at www.druva.com and join the conversation at twitter.com/druvainc.